As the U.S. farming landscape evolves, so are growers’ ways of thinking about crop yields, input choices and farming technology. These shifts are also affecting the players in the agricultural value chain that produce and sell inputs and services to growers. In this Executive Insights, we discuss growers’ input spending habits, the increasing adoption of precision agriculture and the emergence of disruptors in the supply chain. The U.S. farming industry is in the midst of a significant evolution, and traditional ways of thinking about farming methods and input purchasing are evolving as well. An aging grower population, increasing consumer enthusiasm for non-GMO and organic foods, further penetration of precision agriculture, and emerging disruptors in the agribusiness supply chain are some of the dynamics at play across the industry. How are farmers changing their purchasing decisions against the backdrop of these broad industry changes? And how will these changes affect the players in the agricultural value chain that produce and sell inputs and services to these growers? L.E.K. recently surveyed 300 U.S. farmers to gain insight into input purchasing decisions and the competitive dynamics in the supply sector. Our findings yield a thought-provoking picture of where farming is today — and where it’s headed. In this Executive Insights, we discuss growers’ shifting preferences toward branded products as well as local and regional input suppliers. We also delve into the increasing adoption of precision agriculture — a trend that’s expected to continue on an upward trajectory. Lastly, we look at the evolving channel dynamics among input retailers, including the emergence of disruptors such as Farmers Business Network (FBN), and what it means for the agricultural value chain. The definition of the American farm is evolving. It has changed, even since just two decades ago. U.S. farms have increased in size over the past 20 years as the number of farms decreased — leading to a slow decline in total farmland. And farm operators are increasingly aging; as their numbers drop, farm participation is waning. Another shift: Farms generating more than $500,000 in annual revenues increased their share of all farms from 4% to 8% between 1997 and 2016 and were the only farm segment to grow in absolute terms over this period. Although they currently comprise roughly 10% of all farms, the trend is toward larger farms. Crop attributes are starting to change, too. A prime example is the growing prevalence of organic farming, fueled by increasing consumer demand for clean, natural foods. Certified organic farmland grew 6.6% per year from 2011 to 2016, although it represented less than 1% of total farmland in 2016. Amid these demographic changes, growers are investing their dollars with maximized crop yields top of mind. Whether it’s the inputs needed to most effectively increase those yields, adoption of or increased spend on precision agriculture, or a subscription to a farmer-to-farmer network, will the product produce a positive ROI per acre? With that question in mind, let’s take a look at what our survey revealed about input purchasing trends. Growers’ current and expected future input spending habits are good news for suppliers. More than half of growers say they spent more on inputs per acre in 2018 vs. 2015. Moreover, even if commodity prices remain at current levels, more than half of growers expect to increase spend per acre through 2019, similar to the percentage who did in 2018. But where are growers allocating this spending with greater frequency? The answer: branded products. Many growers appear to be maintaining or increasing spend on branded inputs despite higher costs. Growers value the trustworthiness of branded inputs that they know will perform strongly — and they’re willing to pay a higher price. 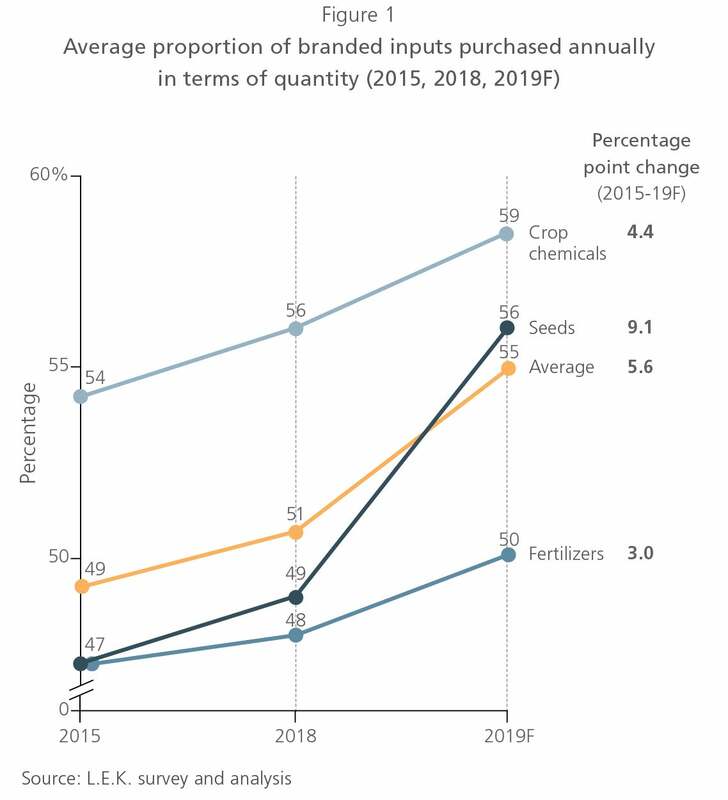 Our survey shows that growers are expected to increase their use of branded inputs by quantity to 55% in 2019, up from 51% in 2018 (see Figure 1). Technology — including precision agriculture — is changing the way farmers think about optimizing yields, with significant implications for input application. Accordingly, current users of precision agriculture expect to increase spending while adoption is increasing, with more growers expected to hop on the precision agriculture bandwagon through 2019. Nearly half of growers today use precision agriculture services, and Gen X (ages 36-51) farmers, farms in the Northeast and South, and farms with more than 1,000 acres over-index to precision agriculture users. Approximately 25% of users take advantage of nine or more different applications of precision agriculture (e.g., soil sampling, monitoring and mapping; equipment positioning and guidance). Precision agriculture results have been positive: Users report that yields improved by nearly 60% relative to the yields of nonusers over the past two years. Furthermore, almost one-third of precision agriculture users ranked reduced input costs and improved yields as the top benefits of precision agriculture. 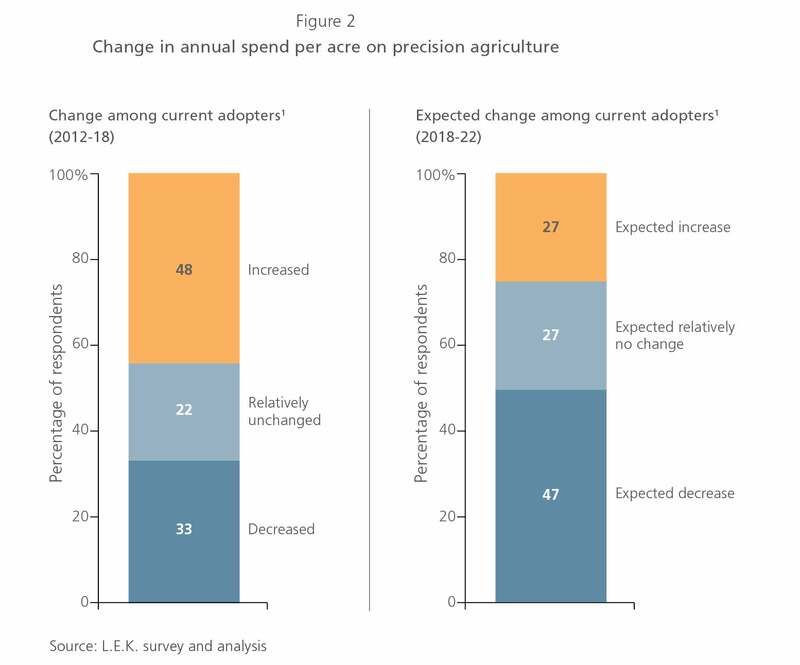 While almost half of current precision agriculture users increased spend from 2012 to 2018, spending is expected to decrease through 2022 (see Figure 2). So while there’s a cohort that will use it more, there’s a larger cohort that will use it less. These findings suggest that a number of users haven’t been satisfied with the value precision agriculture provides — an issue that precision agriculture needs to address going forward. Not only are growers gradually shifting toward branded products and new agricultural technology, but they’re also re-evaluating how and where they purchase these products. And FBN and other ecommerce disruptors have entered the market — setting up a supplier channel environment ripe for change. 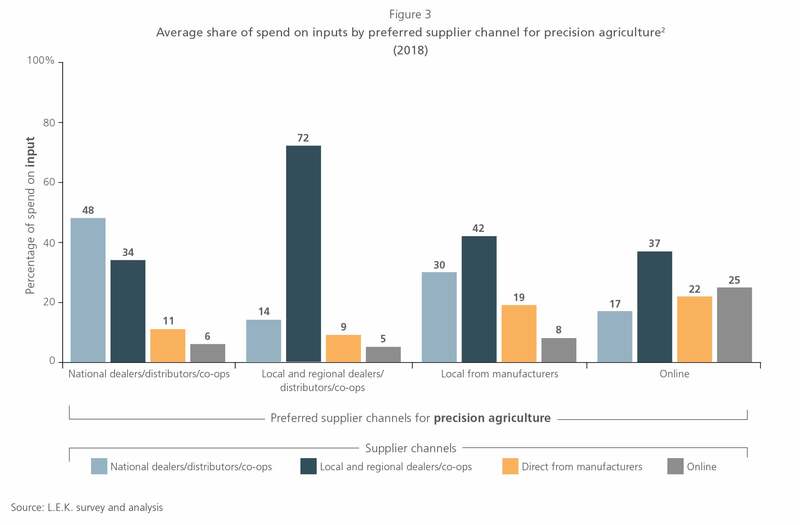 First, growers tend to purchase their inputs through the same supplier channel that they use to purchase precision agriculture (see Figure 3). Take the local and regional suppliers, for example: Nearly half of input spend and over 35% of precision agriculture are flowing through that channel, creating an opportunity for pull-through input demand. And while channel mix is steady for inputs, they are growing their lead, albeit slowly, in precision agriculture. FBN and other channel disruptors such as Indigo are emerging on the agribusiness scene, and FBN is possibly the most visible new kid on the block, with its $110 million infusion in new venture funding in November 2017 (bringing its total funding to roughly $200 million). This farmer-to-farmer network, which provides aggregated analytics to its subscribers and has started selling inputs direct to its customers, is making moves to disrupt other channel segments through its online platform. 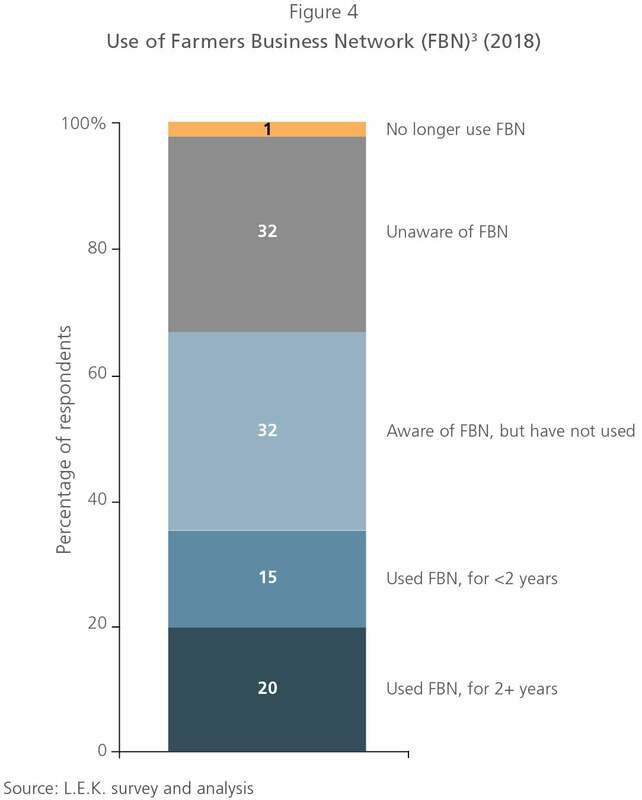 Our survey revealed that roughly two-thirds of growers are aware of FBN, half of whom are currently using it for either precision agriculture services or inputs (see Figure 4). However, use varies significantly by generational cohort: Nearly half of millennial and Gen Xer growers use FBN, while only 7% of baby boomer growers do. Growers most commonly use FBN for the benchmarking, “seed finder” and yield-potential tools, as well as for the precision maps for soil, yields and planting. Growers indicate that FBN adds great value through its data offerings for large farms (greater than 1,000 acres) in particular. For example, access to precision map tools is the top reason among large-farm operators for using FBN, whereas it’s the least-cited reason among operators of small farms (100-999 acres). So how much of an impact will FBN and other ecommerce disruptors have on input purchasing? 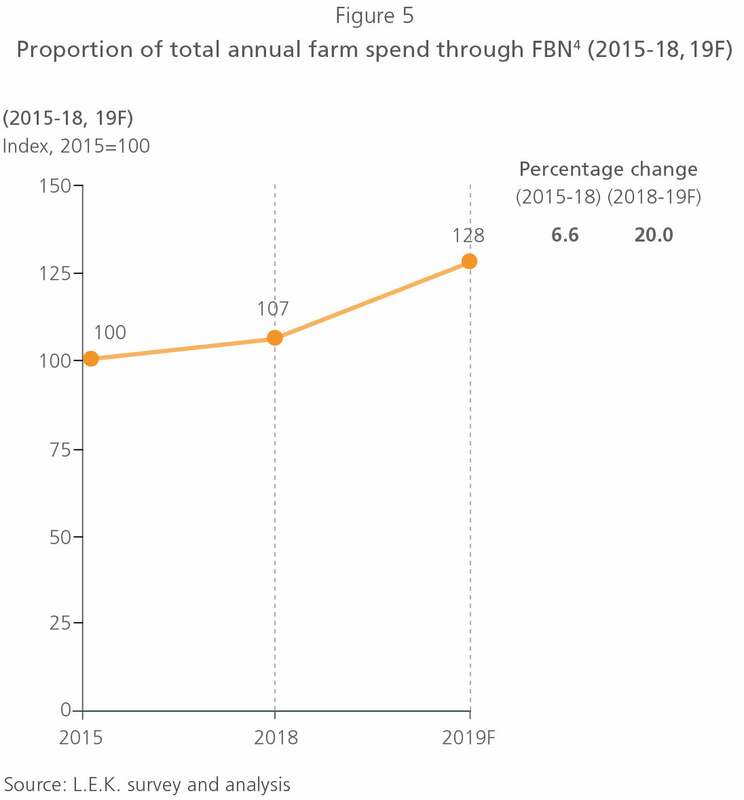 FBN’s share of spend is trending upward, although most of the increase is forecast to occur from 2018 to 2019 (see Figure 5), while growers’ percentage of spend through other supply channels (e.g., online, local/regional suppliers) has remained relatively flat over the past two years and is expected to stay that way. FBN is also expected to capture a greater share of users’ annual farm spend, creating a potential headwind for incumbent channels. In particular, younger growers are likely to continue using this disruptor: Millennial growers expect to increase spend though FBN by approximately 30%, Gen Xers by 15%, from 2015 to 2019F. What should incumbent channels be thinking about amid this change? First, online disruption is a clear and present threat. We’ve already seen Amazon change the landscape of retail and grocery, Home Depot’s impact on traditional building and construction contractor/dealers, and Tractor Supply’s effect on independent animal feed dealers — and input dealers are not immune from the same kind of shake-up. Currently 81% of non-FBN users’ total annual spend goes through local/national retailers. It’s imperative that retailers develop strategies to combat FBN on precision agriculture and inputs. Otherwise, as FBN grows, input retailers risk losing share of grower wallet to FBN bit by bit. What’s next for input manufacturers and retailers? The U.S. farming industry is evolving, which is having a profound effect on how growers think about crop yields, input choices and farming technology — as well as how and where they purchase their inputs. At the same time, we’re witnessing an attempt by ecommerce and channel disruptors to reshape the supply chain. And manufacturers and retailers that are slow or unable to react to these changing dynamics will find themselves at a great disadvantage. To stay ahead of these accelerating changes, manufacturers will need to consider how their channel strategies may need to shift. And input retailers will also need to evolve in new ways to combat the challenges from digital disruptors. While these shifts are almost certain to create opportunities, those who proactively take swift, tactical steps to adapt are likely to profit the most.